Flexibility- 8CH sPoE repeater enables you to place your cameras in a more flexible way. Additional Repeaters are addable to the system. 32 channel NVR means you can add extra cameras to the system to fit your needs. 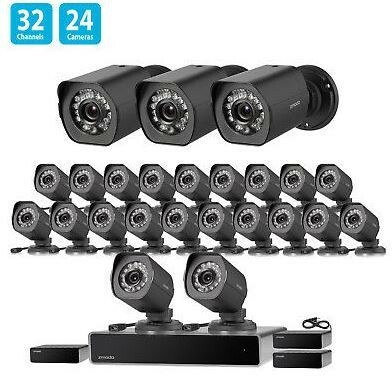 HD Picture - View your cameras live in crystal clear 720p HD at any time of day with automatic night-vision (up to 65ft away). IP65 weatherproof rating means that you can install cameras anywhere. 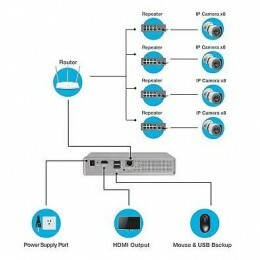 Effortless setup- Simplified Power over Ethernet - Cameras connect to the NVR with a single cable that transmits both data and power, allowing for an easier, cleaner, and more flexible installation. Receive an alert and a short video clip whenever motion is detected, view live video, customize motion detection areas, create alert schedules to reduce unwanted alerts, and much more. 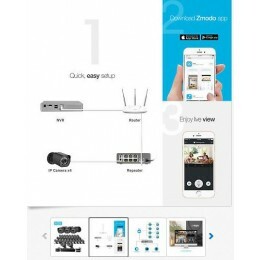 Multiple viewing options-Easily watch live videos in wide screen on TV or monitor via HDMI port or remotely access the view on the free Zmodo app for your iOS/Android device or PC website anywhere anytime. Just download the app and the system will automatically connect to the app. US-based Zmodo tech support & live time tech support- get immediate live chat support from the Zmodo app. 3-year warranty.